Hotel Galadari is a great pick if you are seeking lavishly furnished rooms in addition to an array of top-class amenities. The hotel is also famed for its sumptuous and high quality buffet breakfast and lunch at the classy in-house restaurant. The downtown location right in the center of the Fort of Colombo, make this hotel remarkable. Embracing the grandeur of the Indian Ocean, Galadari Hotel presents an imperial stay in Colombo. Situated on the aristocratic Lotus Road, the 5-star property is a cozy sanctuary for business travelers, couples, and families in the city. The ocean view hotel is crafted with a world-class infrastructure. The gorgeous atrium nuances the elegance of the property. Further, the hotel swanks an enticing swimming pool that offers the fascinating views of the Indian Ocean and the vivacious Galle Road. There are multiple restaurants inside the premises presenting culinary ecstasy. Adding to that, the hotel boasts of a therapeutic massage center and a gymnasium. The venerated property brags a business center, conference room, and a banquet hall for hosting various social and corporate events. Bandaranaike International Airport is about 28 km from the hotel. The popular tourists attractions in Colombo like Gangaramaya Buddhist Temple, Beira Lake, Colombo harbor, and R Premadasa International Stadium are in the vicinity of the luxurious hotel. Business travelers have an added advantage of staying in the property as the World Trade Center and the Central Bank of Sri Lanka are in propinquity to the place. Galadari Hotel Colombo offers 450 luxurious guest rooms into different categories including Presidential Suite, Royal Suite, Executive Suite, Diplomatic Suite, Superior Deluxe Suite, Executive Junior Suite, Executive Twin Room, King Room, and Superior Twin Room. The air-conditioned modern rooms are featured with separate seating and dining areas. Further, the rooms are furnished with large beds, wardrobes, lounge, working desk and an LED TV with international satellite channels. Other in-room conveniences include a telephone, hairdryer, electric kettle, minibar, and an electronic safety deposit box. The attached toilets are outfitted with a rain shower, a bathtub and free toiletries. The mesmerizing view of the Indian Ocean and Colombo can be enjoyed from the hotel rooms. Tourists can take a splash and plunge in the swimming pool of Galadari Hotel. Children can chill out in the kids pool. Further, guests get rejuvenated in the therapeutic massage center and the sauna room of the hotel. Besides, a range of beauty treatments can be availed at the salon of the property. Fitness enthusiasts may indulge in some workouts in the multi-specialty gymnasium of the hotel. Also, one can warm up by playing a game of tennis at the tennis court of the property. The hotel provides a car rental service for the guests to explore the city of Colombo. In addition, it offers currency exchange and ticketing facility for the expediency of the tourists. The property maintains a 24-hour reception desk, travel counter, free parking, and a designated smoking zone. Other conveniences in the hotel include a launderette, baggage storage, concierge, and elevators. The property facilitates the disabled persons with an easy accessibility. There is a free Wi-Fi connectivity throughout the premises. Moreover, a souvenir shop and an on-site ATM are there at the hotel. 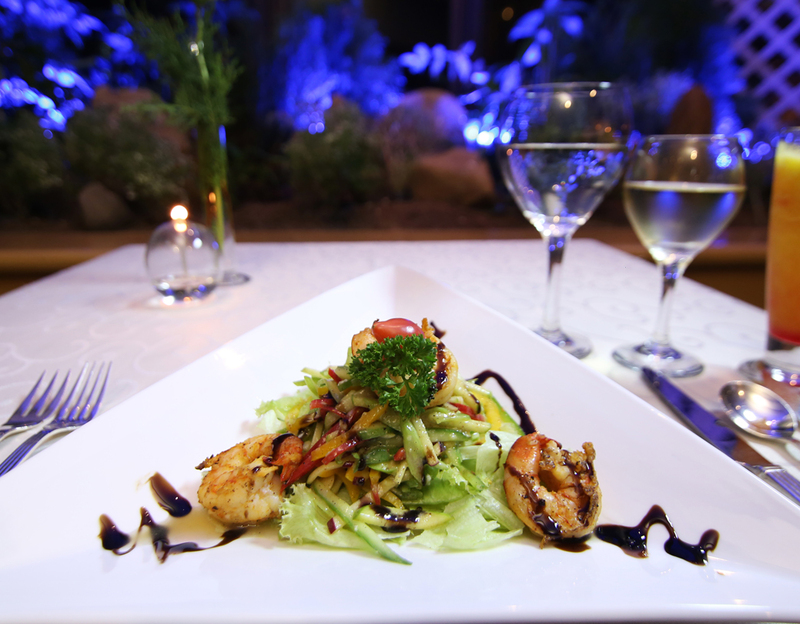 Guests can experience gastronomic merriment at the in-house restaurants of the Galadari Hotel. The Coffee Shop serves a daily buffet breakfast and a themed buffet lunch and dinner. The dining includes Sinhalese, Asian, and international delicacies. Further, Flavours Indian Restaurant offers arrays of Indian recipes at lunch and dinner. Besides, one can dine at California Grill and Sheherezade Arabic Restaurant in the property. To taste some dessert, tourists may step into Cafe 64 Pastry Shop of the hotel. Guests can experience a liquor delight along with some yummy appetizers at Margarita Blue, Lobby Bar, and Arena in The Galadari Hotel. Galadari Hotel welcomes the guests with a majestic hospitality. The hotel is equipped with a squad of multilingual efficient professionals. Tourists staying at the lavish hotel get eternal opportunities to invigorate themselves and experience an incredible retreat in Colombo. How much is the distance of the international airport from the hotel? Galadari Hotel Colombo is about 28 km from Bandaranaike International Airport. Yes, the guests are served with a complimentary buffet breakfast in Galadari Hotel Sri Lanka. What are the activities guests can pander to during the stay at the hotel? Guests can unwind in the swimming pool of Galadari Hotel Colombo. Tourists may avail various massage therapies offered in the property. Further, one can relax in the sauna room. Guests may do some workouts in the gymnasium. Moreover, tourists can indulge in games like tennis and billiards in the premises. The hotel offers a car hire service that the guests can avail to explore Colombo. What are the dining facilities in the hotel? Galadari Hotel Sri Lanka boasts of multiple restaurants in the premises. Guests can savor arrays of local, Indian, Asian, American, Arabic, and international cuisines at these in-house restaurants of the hotel. Further, the amazing taste of the signature cocktails can be experienced at the in-house bars. The check-in and check-out timings at the Galadari Hotel Colombo are 12:00-13:00 hours. Preserving a marine ambiance, Galadari Hotel Colombo offers an ecstatic stay in the beautiful city. With a team of gracious staffs, the 5-star property serves the guests with a grand hospitality. Guests can wind down in the beguiling swimming pool. Further, the multi-specialty gymnasium offers workout sessions in the premises. For the supreme relaxation, there is a therapeutic massage center in the property. Besides, tourists may get some repose in the sauna room. Also, the hotel offers a range of salon service to the patrons. In addition, luggage storage, currency exchange, and free parking facilities are also offered in the property. The hotel comprises multiple restaurants that serve a variety of cuisines to the guests. Presenting an opportunity to explore the splendor of the Indian Ocean, Galadari Hotel Sri Lanka is one of the finest 5-star hotels in the island nation.